People are often so intimidated by making meringue. I know I was, because I heard so many stories of how the least little thing will make meringue go flat. 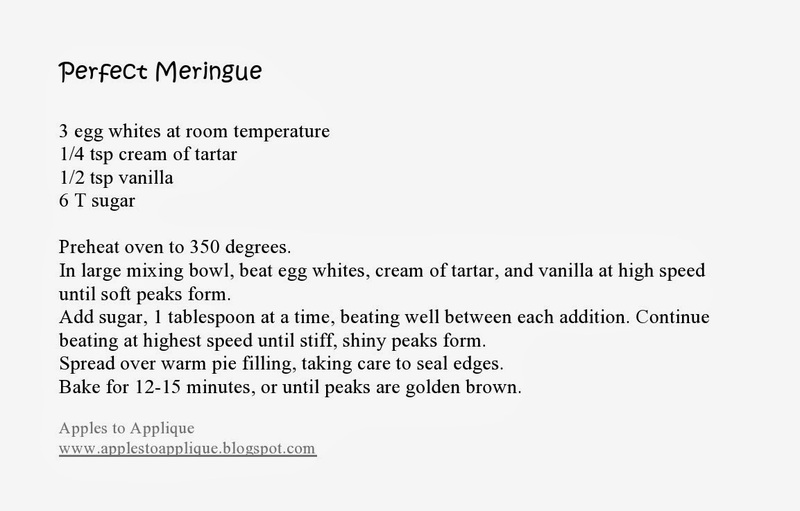 While this is true, I encourage you to try this recipe, even if you've never made meringue before. It is so easy, there's really no reason to be afraid of it! 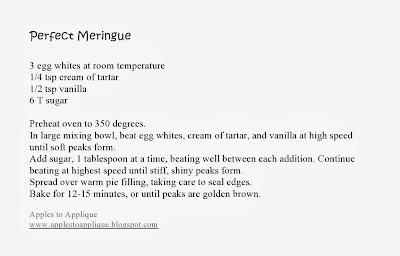 I've been using this recipe for about 10 years, and my meringue has turned out perfectly every single time. For some other good tips, check out this article. This recipe makes enough to cover an 8-9" pie. Scroll to the bottom of the post for a printable version of the recipe you can download. An egg separator. I love this one! It clips on the side of your bowl, which is super handy. First, separate your eggs. If you are making my Coconut Cream Pie, reserve the yolks for use in the filling. Let the whites come to room temperature while you make your pie filling. Place room-temperature egg whites, vanilla, and cream of tartar in a large mixing bowl. Glass or stainless steel is ideal; I was not at home making this recipe, so I made do with what was available for me to use. :) Yay for cooking at relatives' houses during the holidays! Using the electric mixer on the highest speed, beat the egg white mixture until light and frothy. It may take a few minutes, but keep going. You want to get a good amount of volume. The whites should form soft peaks. What this means is they will hold a little bit of shape. Add the sugar one tablespoon at a time, beating well after each addition. Keep that mixer on the highest speed! After adding all of the sugar, keep beating on high speed. The high speed yields ultra fluffiness! You really can't overdo this part. Once I left my mixer running at this stage while I took a really quick shower--I'm not even kidding. The meringue turned out so light and fluffy! At this point, it is ready to be spread on your pie. The pie filling should be warm. As you spread the meringue over the top, make sure to seal the edges. This means make sure there are no gaps between the edge of the pie and the meringue, because it will pull away when baking and weep. Using the back of the spoon, make little peaks all over the pie. Just go crazy and have some fun with it! If you are putting coconut on top, do it now. Bake for 12-15 minutes, or until peaks are golden brown. Meringues are best kept at room temperature. However, if your filling as eggs in it (as mine does) it should be kept in the refrigerator. Sadly, meringues don't last long, and will start weeping and breaking down soon, so they should be served pretty shortly after making. They do still taste fine after they start weeping, they just aren't as pretty. If you try this recipe, leave a comment below to let me know how it went!